polka & bloom: Small Stitches gets a new look! Small Stitches gets a new look! I'm so excited right now! Because I finally got something done I've been wanting to for quite a while - that feels so good! 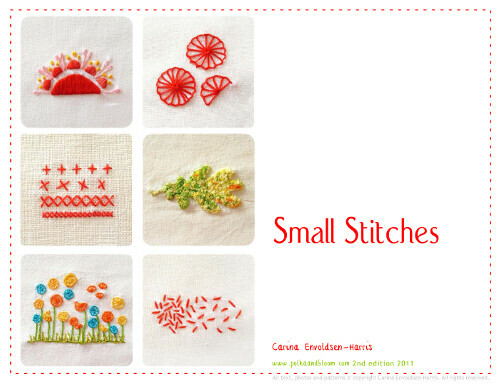 I wrote the "Small Stitches" embroidery ebook in 2009. Then l in 2010 I wrote a.... sequel(!) - "Stitching Borders and Beyond". Ever since I finished "Borders", I've wanted to update the look of "Stitches" so they look more alike. And now I finally have! But "Stitches" hasn't just had a makeover - I've added a whole new section about the tools and techniques you need to get started with embroidery, so it's an even better starting book for beginner stitchers. Plus there's an extra pattern thrown in for good measure. To celebrate the new-look "Small Stitches" ebook, there's 40% off all patterns when bought with any of the ebook products in the Polka & Bloom shop. And don't forget, there's a lefthanded version of both "Small Stitches" and "Stitching Borders and Beyond". You don't have to do anything special to get the discounted pattern price, as long as there's an ebook in your order, I'll send you a 40% refund on the patterns. Nice!